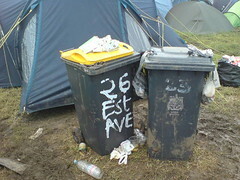 I’m back from the Glastonbury festival 2007, and my head is starting to feel back in one piece again. Well, I actually got back Tuesday early morning but between sleeping and going back to work, I havent had time to do much else. Between me and Will, we managed to get a good couple of hundred photos taken, and uploaded around 100 of them over the week – I found myself having some serious phone battery issues by about the 3rd day! I should really have expected emailing from the phone would eat up the battery… ah well, I know for next time. All the photos I sent back are here, and I’ll upload the rest when I’m next at home. 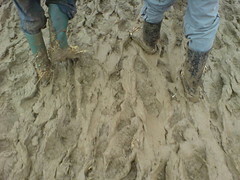 A little tip for anyone buying wellys – make sure you don’t pick up 2 left feet. And if you do, try them on before you leave so you have time to take them back!! I failed at this so ended up at B&Q looking for a replacement, but it turns out the other 169,999 people going to Glastonbury had the same idea, and all that was left was a few girls sizes, and 2 largeish boots that some guy had already claimed. Unlucky? Not so – it turns out the only 2 left were 2 right feet! 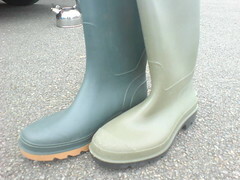 A bit of negotiation later and I talked him into buying them and meeting me in the car park for a welly exchange. Unbelievable luck, even though it meant I’d be the idiot in non-matching wellys all weekend. The weather actually looked hopeful for the first day. Well, by hopeful I mean we were catching glimpses of the sun from behind mostly white clouds. I’d signed up to a 5 day weather RSS feed on my phone, and the fact they’d wrongly predicted rain for wednesday filled me with a little hope – but that didn’t last long. By Friday, the place was the mudbath I’ve come to expect. Any other year this wouldnt have been an issue, but anyone who knows me knows about the time Ive spent getting over a broken knee and I was worried about the effect the mud would have on it. It felt like I was walking through treacle in diving boots, but luckily the alcohol (plus some strategic use of a crutch) meant minimal damage. Well, until I left Glasto and the pain kicked in…! 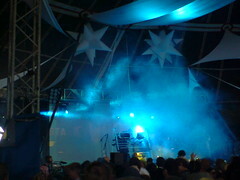 But even that wasn’t enough to spoil the atmosphere, and most of the bands (I saw) had the right attitude and gave the crowds a good show. Magic Numbers pulled off an amazing set, especially considering I’m not all that much of a Magic numbers fan, they still had me on my feet (the girl in front of me wouldnt stop dancing for the entire hour (and kicking mud at me!)). Fratellis were obviously loving the fact they were there at Glasto and threw themselves into an amazing performance, giving all their songs that “live” touch. 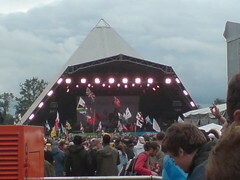 Arctic Monkeys & Kaiser Chiefs took the same attitude and spent the hour singing, joking and chatting with the crowd. I’ll admit I didn’t rate the Arctics version of “Diamonds are Forever” much, but I laughed when I heard Shirley Bassey had thrown some catty comments at them about it the next day! So thats that over for another year. I’m a bit gutted that for the 3rd year running I haven’t managed to get to Lost Vagueness between Friday & Sunday (I always managed to find something else to do! ), but its no big loss. I’ll make sure I get there next year! !